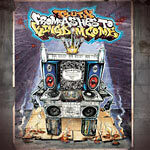 Debut album by Queens emcee Truth, entirely mixed by PF Cuttin (of Blahzay Blahzay). Typical 90's throwback sounding full-length with production from PF Cuttin, Psycho Les (of The Beatnuts), Da Beatminerz, DJ Doom, and newcomer JK1 The Supernova. Heavyweight features include the late Sean Price, AG (of D.I.T.C. ), and O.C. (of D.I.T.C.). All cuts by PF Cuttin, Rock Steady's own DJ JS-1, and Evil Dee of Da Beatminerz. Produced by PF Cuttin (tracks 1, 7, 10); JK1 The Supernova (2-6, 9, 12, 13, 15-17); Psycho Les (8); DJ Doom (11); Da Beatminerz (14).